The photo below got me to wondering what the impact of all those tourists you see on the boats was to the 1000 Islands region. American and Canadian tour boats on the St, Lawrence River bringing tourists to and from Boldt Castle on Heart Island in the 1000 Islands. Nikon D700/28-300VR, 1/125s, f/18, ISO 360, EV 0, 300mm Focal Length. The most recent report on the subject was from 2011. In it the 1000 Islands Region was responsible for generating $456 million from the tourism industry and $56 million in state and local taxes. All currency in US dollars. I can only assume the figures are similar for Canada. That is a lot of boat tours, resort rooms, restaurant meals, souvenirs and other tourist spending. (Source: 1000 Islands International Tourism Council) Keep in mind most of this is done between late May and early September or in about 120 days. 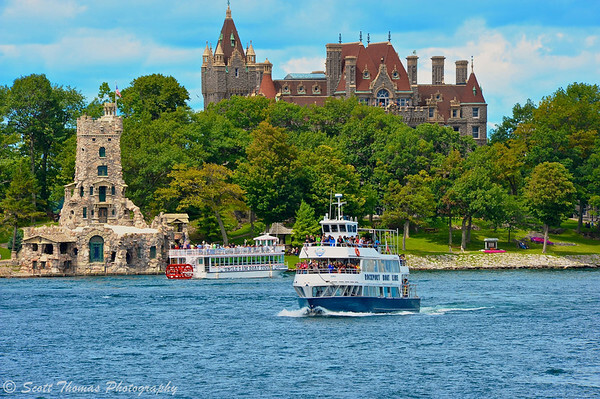 This entry was posted in Travel and tagged 1000 islands, 28-300mm, alexandria bay, american, boats, boldt castle, brockport boat line, canadian, heart island, new york, nikon D700, playhouse, stones, tour, tourism, tourists, trees, uncle sam boat tours, united states, vr, water. Bookmark the permalink. Great shot Scott and great shot for tourism as much as people like to complain about tourism it sure brings in the bucks !! The people who rely on tourism certainly welcome the business. This area is mostly about summer tourist. After Labor Day, it gets very quiet and is a good time to visit until the tour boat operators shut down in early October.